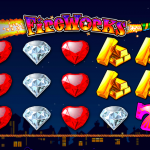 Fireworks is a video slot game from Realistic Gaming that allows you to have an explosive encounter with your fate. The game looks really nice with different kinds of gems and piles of cash you just wish they were yours. The animations are slightly outdated, but still nice. Especially when you hope that the fuse will burn until the end and reach the bonus. You probably expected loads of special features and symbols here but no. There is no wild or scatter in this game, but do not give up yet, there is a bonus feature here. This special feature is included in the game play and it is kind of obvious. As we said there is a fuse underneath the reels and it burns with every spin you make. What you really like to happen is the fuse to light the firework. The only way you can do this is if you manage to land matching symbols on all reels. If you manage to activate the feature you will receive 1 respin and you have to pick a reel randomly which will contain matching symbols. We know that one respin is not much, but you will be satisfied to know that it offers a sure win. 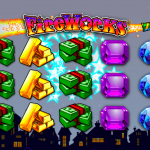 Fireworks turns out to be a very cheerful game to play. Realistic Gaming did an amazing job with this game, especially with the fuse that is underneath the reels. It really keeps you at the edge of your seat while you are playing Fireworks. Who would have thought that such a simple feature can bring so much fun, right? The overall game looks nice and we had a really good experience, so we believe that you will too if you give this game a try. 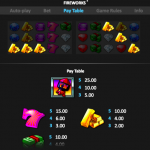 For another great engaging game you should consider playing Double Your Dough a 5 reel slot by Realistic Games.